When can I schedule lessons? Lessons are available in the afternoons Monday thru Friday and evenings Monday, Wednesday, Friday. Weekend lessons are not available at this time. Lesson times fill quickly, so plan early. Do I need to purchase a Groupon for myself and one for my partner? 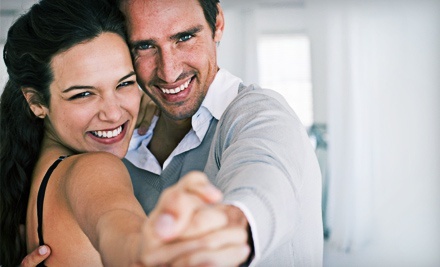 Your groupon is good for two people dancing as a couple. If you are a couple you do not need to purchase two Groupons. Can I use more than one Groupon? No. You may use one of the promotional discounts, one time. You cannot use the private lesson Groupon, and then purchase the group class Groupon to use as well. Choose one or the other. Can I purchase more than one Groupon? You can purchase additional Groupons for your friends, however each individual only gets to utilize one Groupon. For instance, if you purchase a Groupon for yourself and bring your fiancee as your partner, your fiancee can't purchase one and bring you as a partner for more lessons. What dances will we learn? This is an introductory program so your instructor will work with you to introduce you to at least two or three dances. Do not expect to spend the entire time working on just one dance. With the Group Class Groupon, do the classes have to be continuous? Yes. Once you start your classes, you have two months worth of classes to attend. There are no makeup sessions if you miss a class. Can I learn to dance for my wedding? You can get started on your wedding dance with your Groupon, but do not expect to learn to dance an entire dance with just this beginning program. This is an introductory program, designed to introduce you to more than one dance. You will need more than an hour and a half to learn to dance well and look good for your big day. Keep in mind that the more time you give yourself to learn, the more comfortable you will be dancing on your wedding day. START EARLY! so you don't look like you just took lessons the week before your wedding. If you want to work only on your wedding dance, contact me to find out about package rates for lessons. What do I get with my Groupon? Private lessons on your Groupon are 30 minutes in length. We try to schedule lessons at least once a week. You also have the opportunity to come to a dance party. Dances are the 2nd and 4th Saturdays every month. The dance includes a 30 minute group class at 7:00pm and open dancing from 7:30-10:00pm. If you purchased the Groupon with the group class option, group classes are 60 minutes in length. Beginner's class is Wednesday at 6:30pm. Can I combine all my lessons? Unfortunately, no. The lessons will always be a 30 minute lesson. How do I schedule my lessons? For private lessons, please fill out the form at the top of the page, and please make note of your time availability: afternoons? evenings? What would be the earliest time you would be available to come in for a lesson during the week. For group classes, please fill in the registration form at the top of the page or check the schedule and show up for the first night of classes for the month. We always start new classes the first week of each month. Beginner classes are on Wednesdays and Fridays at 6:30pm. not concentrate exclusively on one dance. This gives you an opportunity to try different styles of dances and see if you like social dancing and my style of teaching. Once you've completed your Groupon program, I certainly hope you will want to continue dancing. There are group classes, private lessons and dance parties for you to join if you choose to continue dancing with Impressions. and then register for your Groupon lessons by using the form to your right. Group Classes require pre-registration, so please be sure to make note of which class you would like to attend. For private lessons, please make note of your time availability. Evening lessons are the most popular times, we will get you booked in as soon as possible. Please note: There is a 24 hour cancellation policy. Lessons cancelled with less than 24 hours notice will be charged as a regular lesson. We are no longer selling Introductory Programs through Groupon. If you have a Groupon you would like to redeem, review the information below and contact us via the form to the right. If you are looking for the same great deal, you can purchase the exact same Introductory Special directly from us. Please use the contact form to the right.